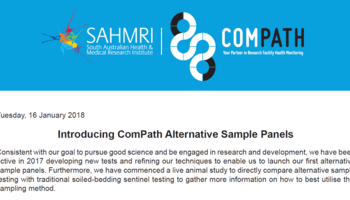 ComPath joined SAHMRI in September 2012. ComPath is an integral part of Health Monitoring and Disease Surveillance Programmes in laboratory animal research facilities. We have adapted and grown to suit the needs of the Biomedical Research Industry and offer services Australia-wide and within the Asia-Pacific region. Our specialised laboratories operate using stringent Quality Management Systems gaining us ISO 9001:2015 compliance. Furthermore, our site operates under an Approved Arrangement with the Department of Agriculture and Water Resources (DAWR) enabling us to accept and house animals in Quarantine. Check out our newly launched M-ALT & R-ALT panels for screening alternative/environmental samples. ComPath is supported by the South Australian Health & Medical Research Institute.